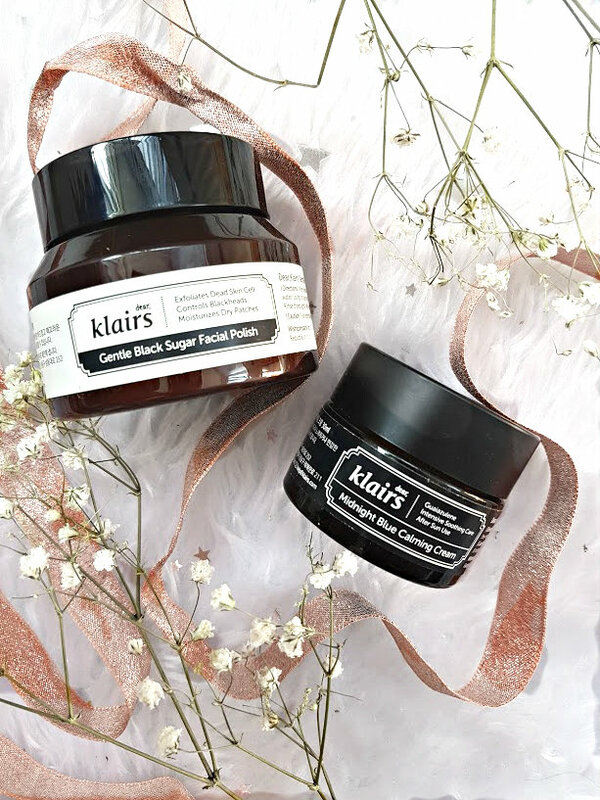 Korean skincare is taking over the world and one brand that gets it right every time is Dear Klairs. They produce products that are targeted to different skincare concerns and don't mess around when it comes to skincare. 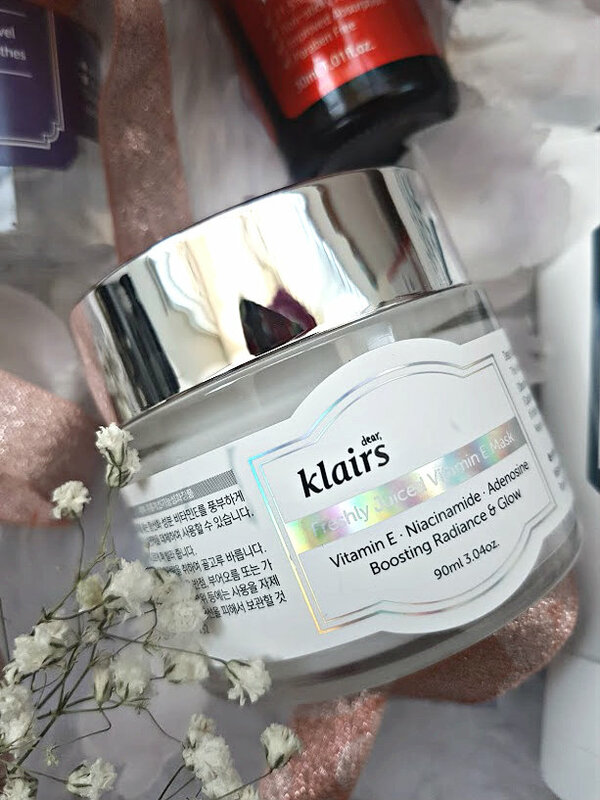 I very kindly recieved a whole range of their goodies from Koja Beauty, which is an online shop that stocks all different Korean skincare brands alonge with vegan friendly products - there is literally something for everyone. I have been testing and trying these different products for a while now and have finally had the time to sit and give you my honest opinion on what worked and what didn't. I have heard such good things about this toner and it I got very excited to use it on my skin, it was the first product of this whole post that got applied straight away. 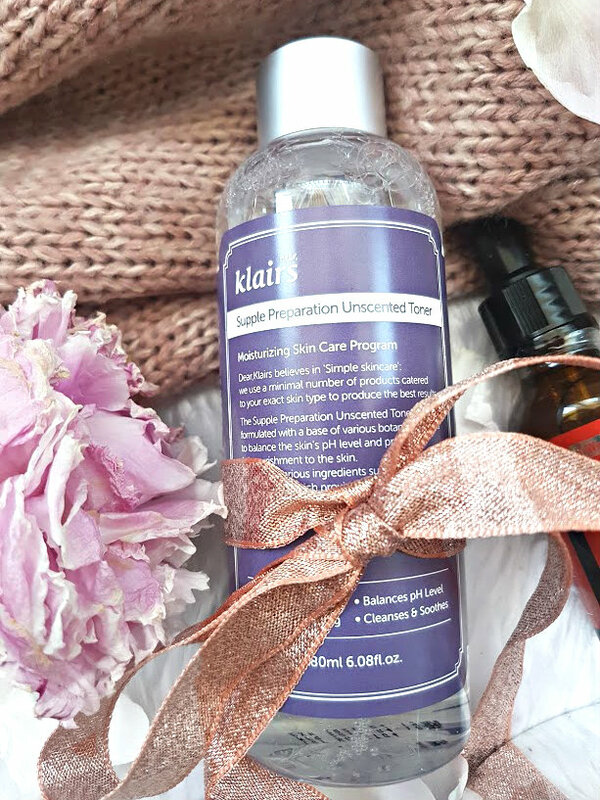 This tone is a new one from Klairs after their very popular scented toner took off, they made this toner to help the skin even more. This toner helps to balance out the skin's pH level and is meant to help you achieve your 'best skin yet'. I love using this in the morning to wake my skin up. A quick sweep of this on a cotton pad before applying moisturiser and makeup, helps my skin retain its moisture and suppleness. I have also noticed that it gives my skin a boost of life and makes it look a lot brighter, not to mention that it diminishes dry skin. It is basically a magical toner! It has not yet broken me out and works amazingly well on my oily skin. Using anything like this on my skin always scares me a little, I am never quite sure of the side effects. 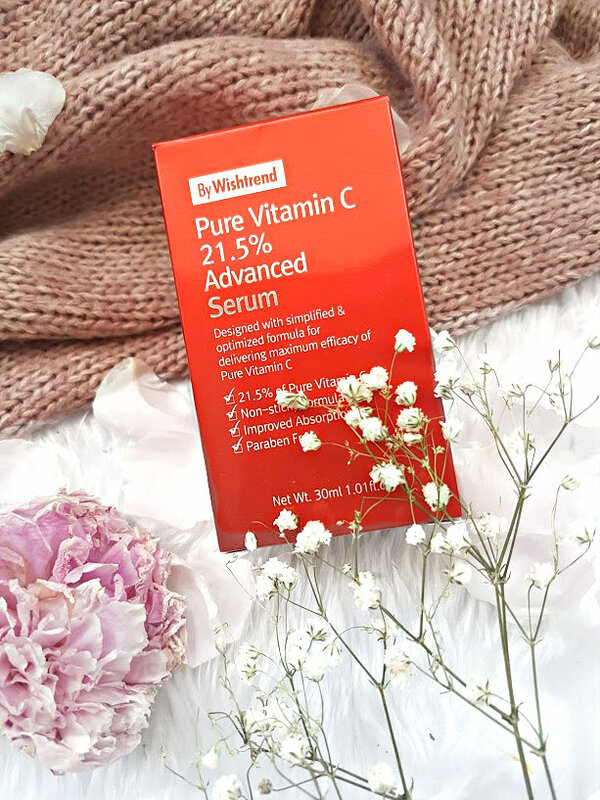 However, after reading several reviews and watching videos about the benefits of vitamin c, I started to slowly incorporate this serum into my evening skincare routine. Intially, I only applied it to my forehead - this is the area that is dull and has a lot of scaring. I used it non stop for two weeks and now I use it every other day. In this time, my forhead is so CLEAR. The scars are slowly fading (something that isn't going to happen over night) and my forehead is so soft and texture free. I love how this has made it seem like I have a new forehead altoghther. I am now starting to apply it to the remainder of my face and hope that I will see the same results! This is one of those products that you don't really think you need but when you have it, you love it and don't stop using it. This soothing cream off the bat, smells incredible - relaxing almost and it is a pleasure to apply to the skin. As a moisturiser it helps to support the skins natural moisture barrier and improve cells over time. 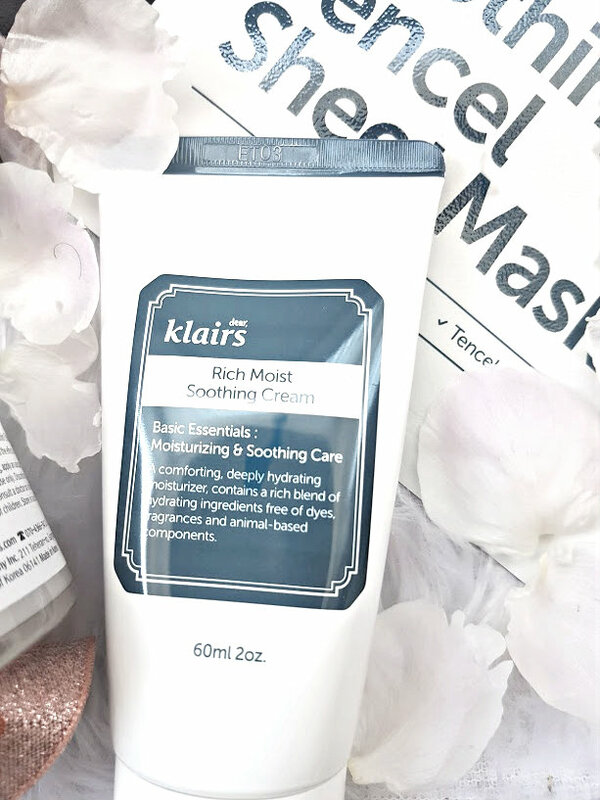 It has worked best for me when my skin is extra dry, it comes to the rescue by adding all the good things back into my skin and support the dryness but not fighting it. Once my dry skin has 'gone' I have to stop using it because it makes my face feel really greasy and that is probably due to how thick it is. A bit of background about this mask, it contains a combination of Vitamin E and Niacinamide, which together provide a brigthening effect to the skin. It is a multi-use mask, from being able to use it during the day, as a quick mask or overnight. I have to be honest, I had no idea that vitamin E had so mnay benefits and could help the skin. It works even better when used inconjuction with vitamin c and the two enhance the effects of each other. This has a funny texture, its like jelly but then when it comes into contact with the skin it becomes a thick essence and it stays like this. The first time I used this I applied it straight onto my skin and left it over night, this was only on the cheeks. The next morning my skin did look brighter but it had also broken out, not with massive spots but those horrible under the skin ones that hurt like hell. I was so upset because I had just high hopes, but I left it for my skin to calm down and then went back into use it. This time I too a little amount with the vitamin c mentioned above and applied it on the same cheek. The next morning, my skin looked a lot brighter, felt smoother and no painful bumps! So bizzare how mixing it worked better than using it on its own. I use this once a week on alternative areas of my face just in case it breaks me out again. I have reviewed this little tub of magic before and you can read the full review here, so I won't dwell on it too much. In a nutshell, this is the cream that you apply to your skin when you have any problem, and that isn't just limited to the face. Its a very intensive hydrating cream that heals and soothes the skin in one. I apply this in small amounts overnight and wake up to my skin looking less red and a lot calmer. I used this on a curler burn the other day and it worked wonders, it calmed the burn and is hasn't left a scar either! Exfoilating the skin is so important and the texture that I was suffering with around my chin area a while back was down to me not removing the dead skin that was layering up. This scrub smells, looks and feels just like sugar - literally. I use it twice a week to ensure that dead skin cells are removed and my skin is left feeling soft and smooth. Makeup is applying so much better now as well and doesn't look all cakey and textured. I think this is a fab product and the tiniest amount of this goes a really long way, its so much fun to use as well! 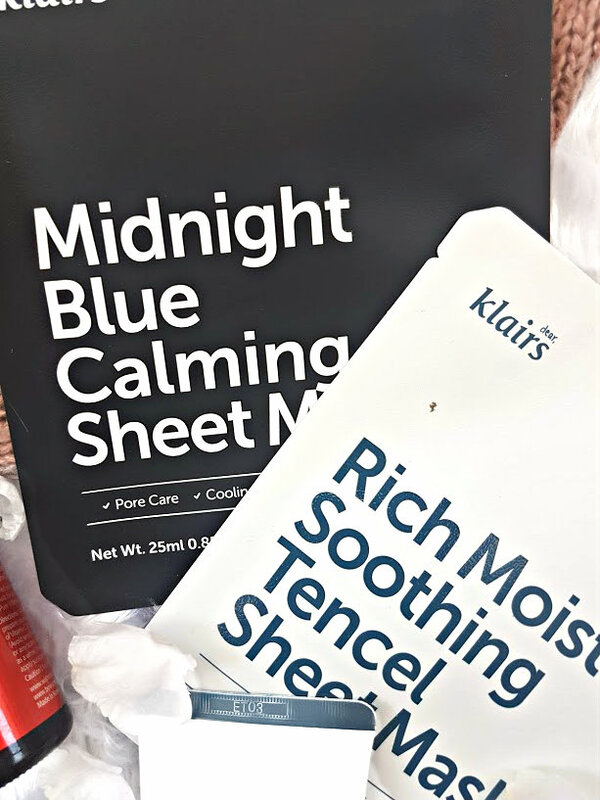 Sheet masks are a big trend within the skincare world and I love them. They are a lot easier to clean up and do compared to a traditional mask. Both of these masks are part of the different ranges that Klairs offer. 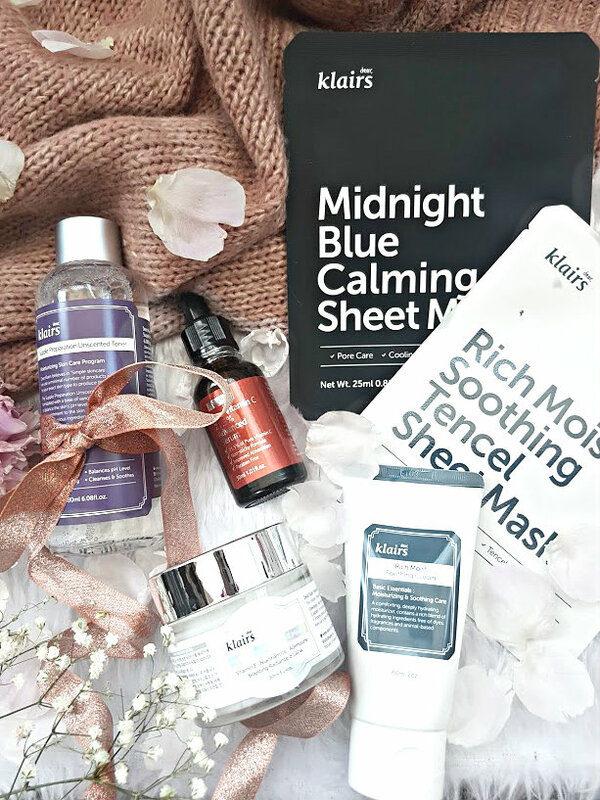 The blue mask is perfect if, like me, you have sensitive skin as this calms it down and helps to combat oil - I used this one day when it was realllly hot and my skin felt so cool afterwards. Then we have the soothing mask, which as the name suggests, soothes the skin and let me just say, I need to buy a lifetime supply of these. This mask contains aloe vera (my skin loves this stuff), and hyaluronic acid. After using it, I can see instantly that my face looks awake, refreshed and so glowy. It was perfect to use for when I wanted a minimal makeup look with dewy skin. If you have survived this whole post then you deserve a medal, it is so lengthly but I really wanted to give my whole round opinion on them all. 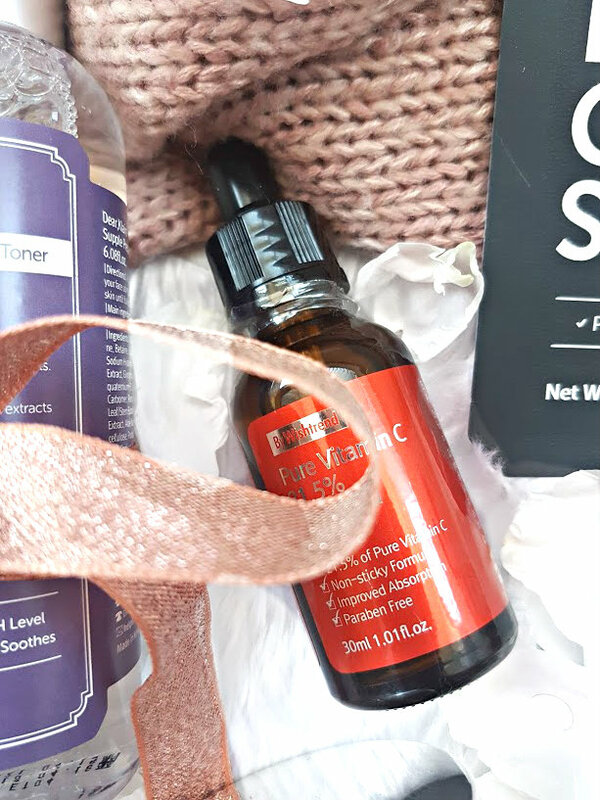 I have teamed up with the lovely people at Koja Beauty to giveaway a Vitamin C serum - this has worked amazingly well on my skin and I am sure it will on yours too. 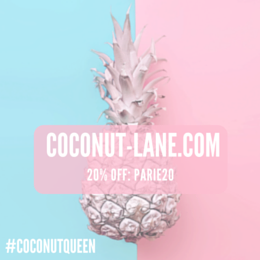 Just enter using the rafflecopter below - best of luck and thank you as always for stopping by xoxo OPEN INTERNATIONALLY!